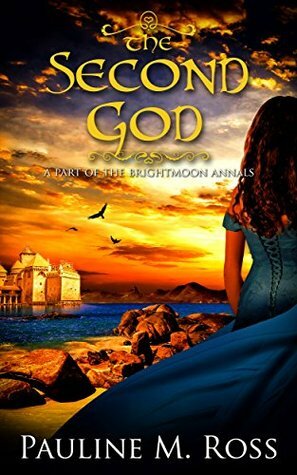 The Second God is the seventh book in Pauline M Ross’s richly fantastical Brightmoon world, and serves as a sequel to The Fire Mages’ Daughter. Five years after a devastating war with the Blood Clans, Drina, her lover Arran and her husband, Ly-haam the living god of the Blood Clans, have settled into a routine, but when a second living god appears in the Clanlands and a mysterious golden army attacks Bennamore’s neighbours in the east, Drina, Arran and Ly must bring all their powers to bear, united as one, to protect Bennamore and aid its allies. One characteristic held by many good books, I think, is to want to keep reading it after you’ve already finished it. That is how I felt last night as I climbed into bed – “just one chapter, maybe two, then I’ll go to sleep,” I thought, before remembering I’d already finished reading it. That’s not to say the book felt incomplete – far from it, it ended brilliantly – but that I could easily continue reading more in that world, and in Ross’s style, if there were more to read. Ross has a great strength in her style of prose. It’s engaging, well-paced and eminently readable. She has the skill to know when plain language is needed, but the vocabulary to expand when the scene calls for it. The Second God is a well-balanced adventure. Drina’s position within society, as the Drashona’s heir, lends itself to the political elements of the plot well, and Ross skillfully avoids the pitfall of making the political elements dry or uneventful, masterfully weaving in these parts of the story with the more hands-on aspects of Drina’s role: flying about the world on the back of a giant eagle to observe, discuss, fight or learn. Whenever I read books by Pauline M Ross I am delighted to explore more of her world. It is an abundantly complex world about which there is always more to discover. Its magic is enchanting and it is filled with cultures whose development and society are influenced in different ways by that magic and its various facets, as well as geography and history. The beauty of the world is enhanced by the optimism with which Ross writes – even when circumstances are dire and threats loom, there is still a sense of joy and hope which brings a refreshing contrast to the gloomier outlooks of a lot of modern fiction. As with all of Ross’s works, The Second God explores romantic relationships within different social frameworks to those found in Western Earth cultures, and this time takes it a step further than The Fire Mages’ Daughter by adding a new magical component. But as always, the romance is perfectly integrated into the plot, an essential element of it. As someone who tends not to read the Romance genre, I felt it was handled well. The Second God is an exciting, captivating read showcasing Ross’s signature positivity, unconventional romance and inspired worldbuilding, with a strong plot and enjoyable characters. I rate it 9/10, and eagerly await the next one. I received a free ARC in exchange for a review; and can only apologise that the review was so late.